I installed this piece at the Luggage Store Gallery in San Francisco. The central windows facing Market Street were removed and the local pigeons invited to spend time in the structure. All the ledges were weight sensitive and as the pigeons landed they would trigger turntables and sound elements in the gallery. They were never disturbed because visitors had to watch them through small door viewers in the walls. The image below shows a record suspended with strings and surrounded by pigeon feathers that would strike the strings when disturbed. The pigeons would cause the fan to turn on and the sound would be amplified by the turntable cartridge resting on the record. 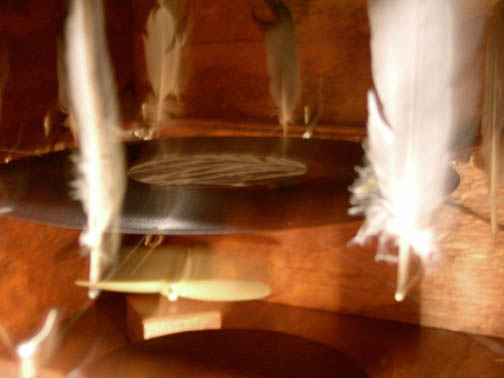 An acoustic bell made of paper amplifies a record when pigeons arrive. The VIDEO below shows the piece in better detail.